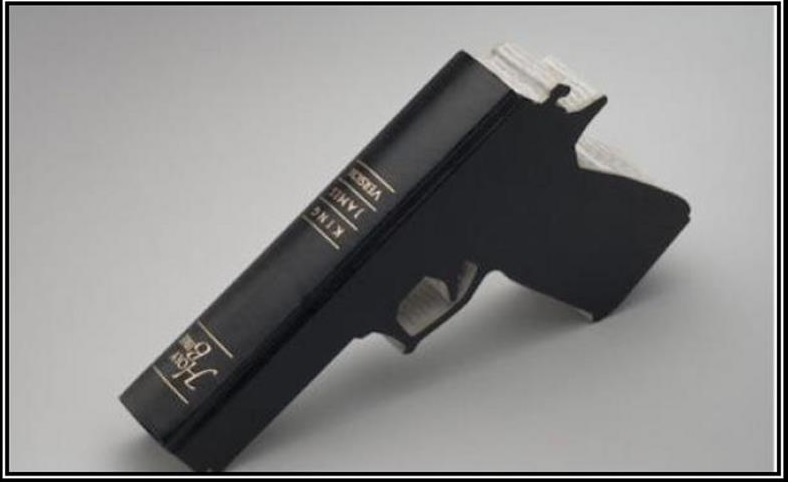 John Piper recently released an article here entitled, "Should Christians Be Encouraged to Arm Themselves?" wherein he argues, using 9 points, that it is against the tenor of the New Testament for a Christian to use force against his foes. I would like to thank Dr. Piper for his insights, his concern for the peaceful thrust of the New Testament, and for bringing this topic into the spotlight. I myself have been very concerned with an attitude that I see in my own Christian circles (Reformed) concerning a preoccupation with, and overemphasis upon guns. Perhaps this is the attitude that Dr. Piper was intending to react against, an attitude which I myself have come close to writing against several times. I hope this was Dr. Piper's intention. However, since he has fired the first shots in this debate (pun totally intended), I feel that it would be most beneficial to respond to his article since I believe he has missed the mark. Below I will outline Dr. Piper's nine points and give a brief response to each one. 1. The apostle Paul called Christians not to avenge ourselves, but to leave it to the wrath of God, and instead to return good for evil. And then he said that God gave the sword (the gun) into the hand of governmental rulers to express that wrath in the pursuit of justice in this world. I agree completely with his first point here. God has called us to refrain from avenging ourselves and he has left the power of the sword and gun in the hands of the governing officials. However, I believe that Dr. Piper has missed a very important aspect of his first point. Namely that the government has both the right and the responsibility to protect those under its care. In order to do this, the governing authorities hire men and women to carry guns and partake in lawful and orderly enforcement of the law. Some law enforcement officers have more authority and some less, and they all have differing responsibilities. In fact, some of those law enforcement officers are civilians, like you and me. This is why it is still legal to make a citizen's arrest and carry a gun and help the government to protect the safety of those living within its borders. For all intents and purposes, the state is employing citizens as volunteers to keep the innocent safe from evil men. So if the governing authority passes their "sword" to police officers, FBI agents, security guards, and civilians in order to protect others, then each party is simply an extension of the governing authority which has a God-given right to use "the sword." This is not un-Christian as Piper supposes, but it is very Christian to lock arms with the side of justice and righteousness in whichever way the governing authority permits. 2. The apostle Peter teaches us that Christians will often find themselves in societies where we should expect and accept unjust mistreatment without retaliation. Again, I cannot help agree with Dr. Piper here, especially since he simply quotes Scripture. But in this argument he seems to mix up defense of the innocent with the persecution that comes from "doing good" as believer in Christ. If my response to his first point is correct, then it makes sense that an armed civilian may serve the government in the same way as an armed police officer, as the state permits. I don't know anyone who thinks that they should be able to use his firearm in order to respond to persecution. 3. Jesus promised that violent hostility will come; and the whole tenor of his counsel was how to handle it with suffering and testimony, not with armed defense. They will lay their hands on you and persecute you, delivering you up to the synagogues and prisons, and you will be brought before kings and governors for my name’s sake. This will be your opportunity to bear witness. Again, as in point two, Piper fails to differentiate between persecution and an intruder who intends to harm the innocent. If a person is "delivering you up to the synagogues and prisions" and bringing you before the "kings and governors" they are seeking to act within the law, not break it. They are supposing that YOU dear Christian are the law breaker who deserves the sword. They are bringing you to justice. So let me say this clearly, if you are arrested for the cause of Christ, don't fight back. But this still has nothing to do with whether or not a Christian should carry a weapon or not. 4. Jesus set the stage for a life of sojourning in this world where we bear witness that this world is not our home, and not our kingdom, by renouncing the establishment or the advancement of our Christian cause with the sword. Piper is correct; the Christian cause is not to be advanced by the sword, or gun, but by the power of the preaching of the gospel which is sharper then any two edged sword, and more powerful than any AR-15, but I have yet to meet anyone who suggests that we should advance the kingdom by the tip of a bullet. I likewise affirm that this world is not my home, I'm amillennial and thus I am patiently waiting for Christ to make all things right in the world to come and thus I have no desire to try to establish any type of Christian government, or Christian power. I therefore agree with Piper perhaps more than most on this point. This world is not my home, I'm waiting for the next. But does this mean that I cannot partake in this world? Should I not buy a home in order to show unbelievers that my hope is not in this world? Should I only lease my car? Or can I be a fully functioning member of my society as I await the coming of our Lord and Savior? Just because this world is not my home does not mean that I cannot or should not care for it and its inhabitants. One of the ways that I do this is by carrying a weapon in order to preserve and protect those who are sojourning with me, and even those who are sojourning to the lake of fire. Again, if my point one is correct, then carrying is a righteous way to partake in this fleeting world. 5. Jesus strikes the note that the dominant (not the only) way Christians will show the supreme value of our treasure in heaven is by being so freed from the love of this world and so satisfied with the hope of glory that we are able to love our enemies and not return evil for evil, even as we expect to be wronged in this world. Does Dr. Piper expect police officers to abide by this principle? Or is it acceptable to use force when needed? Again, as in point four, I don't have to allow evil men to trample over me in order to show that my supreme treasure is heaven. Perhaps by obeying my Lord's command to "love my neighbor" I show that my supreme treasure is heaven? Perhaps I love my neighbor by being ready to protect her? 6. The early church, as we see her in Acts, expected and endured persecution without armed resistance, but rather with joyful suffering, prayer, and the word of God. This point has already been covered. We should endure persecution. We should embrace suffering. But Jesus has already described our persecution in terms of "being delivered over to judges." If a Christian is arrested for being a Christian and for preaching the gospel, then he or she should go peacefully just like our Lord, for this will be our "opportunity to bear witness." 7. When Jesus told the apostles to buy a sword, he was not telling them to use it to escape the very thing he promised they should endure to the death. Here Piper seeks to establish that when Jesus tells his disciples to take a sword with them in Luke 22, that He was not encouraging them to think in terms of literal swords, but He was simply using the sword as a symbol of preparation. I agree with Piper's interpretation of this passage. He seeks to show that this passage doesn't refute his previous 5 points. I agree. That particular passage does not refute his first five points, but I don't think that passage is necessary to refute them. Obviously, I believe that I have thus refuted all of them up until this point, otherwise I wouldn't still be typing. "I realize that even to call the police when threatened — which, in general, it seems right to do in view of Romans 13:1–4 — may come from a heart that is out of step with the mind of Christ. If one’s heart is controlled mainly by fear, or anger, or revenge, that sinful disposition may be expressed by using the police as well as taking up arms yourself. Here, he acknowledges that calling the police is an acceptable action to take in particular situations. However, he wants us to do what is Christian instead of what is acceptable. He wants to make sure that if we call the police, it's because of a need for the police and not because we want to get our neighbor in trouble. I second this point and commend him for making it. However, this point does acknowledge that sometimes calling the police is the Christian thing to do. Each situation needs to be examined appropriately, not in the light of what is socially acceptable, but what by what is Christologically right. I would give this same advice to anyone who carries a firearm. If a man breaks into your home, you have the legal right to kill him; but just because you have the legal right to kill someone does not mean that you should. Every situation needs to be examined appropriately, not in the light of what is legal, but in the light of what is Christologically right. Should you shoot your wife's attacker? Maybe. Maybe not. Each situation requires godly wisdom. Every police officer must make those same decisions every day. But again, a police officer may kill a man because he has the legal right to do so, but a Christian should operate from a heavenly perspective and disregard his rights in order to do what is right. 9. Even though the Lord ordains for us to use ordinary means of providing for life (work to earn; plant and harvest; take food, drink, sleep, and medicine; save for future needs; provide governments with police and military forces for society), nevertheless, the unique calling of the church is to live in such reliance on heavenly protection and heavenly reward that the world will ask about our hope (1 Peter 3:15), not about the ingenuity of our armed defenses. Perhaps Piper is again confusing persecution of the church with "ordinary means of providing for life." If an intruder enters my church with a gun and begins killing off my sheep, I will not hesitate to protect them and put an end to the intruder. The government has given me this privilege to help them govern and protect the innocent whom God has entrusted them to protect. 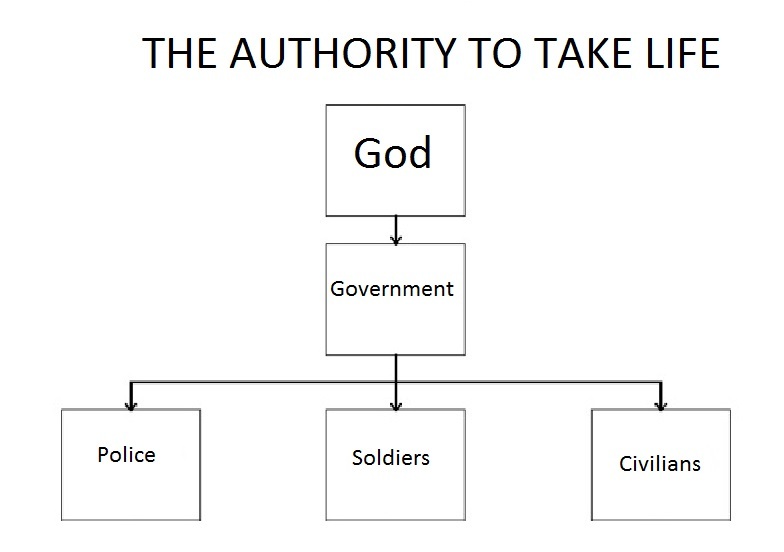 Here's a crude chart that I made to explain the order of authority. 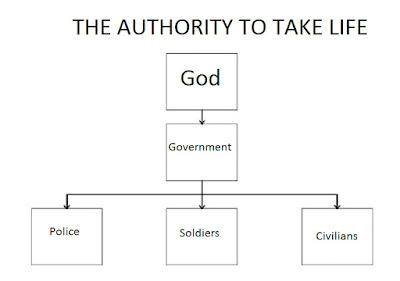 Notice that the church is not given any authority to take life. But also notice that Christians are sometimes police officers and have need to do so. Some Christians are soldiers and have need to do so. Come Christians are civilians and may find themselves in a situation where they need to do so. I can remember a former pastor of mine who recounted the time when he was stopped in traffic right in front of his friend's stolen car. He got out and walked back to the stolen car in order to confront the thief. When the thief was confronted he put his foot on the gas hopping over the curb and onto the next roadway. My former pastor was thrown onto the hood and his life was in danger. He was able to safely jump down and escape before the car was traveling at too high a rate of speed. He ended the story by saying, "I'm thankful that I did not have my weapon on me at that time. I may have used it, and done so unnecessarily." That has always stuck with me. I carry a weapon, but I do so with great fear and trembling. No Christian who carries should ever want to use it. I think that Piper has missed the mark on this one, and I encourage wise men to carry a weapon and to do so carefully, Christologically, and only use it when needed, and never use it to fight off persecution for the faith.